A Beginner’s Guide sets up introductory ideas about belief, the nature of human understanding, the Bible, and spirituality to form a basis for further exploration and study. David Saffold’s self-help book A Beginner’s Guide to Perfection encourages the use of spiritual wisdom as a means of inspiring change. Saffold argues that every person holds “core beliefs” about themselves and their place in the world; if not adequately examined, these can lead to difficulties like poor self-esteem, overeating, and addiction. The book seeks to provide a guide for helping people change their relationships with themselves. Core beliefs might stem from a difficult childhood or trauma or simply from the challenges of daily living. Because core beliefs drive actions, negative ones can detrimentally define a person’s experience of life. This book offers a way forward, encouraging its audience to challenge unwanted or unaccepted core beliefs and change them into healthy ones. It is organized around a process of transformation, moving from destructive beliefs to understanding the “personal world,” accessing and expanding power, challenging beliefs, and rebirth. The goal is perfection, based on biblical understandings—a sense of wholeness or completeness that will lead to a new personal relationship with God based on integrity, confidence, courage, passion, and purpose. The book’s arguments are effective and build off of Saffold’s personal reflections, such as how, as a child, he dealt with the suicide of his grandfather and the resulting family trauma. His story becomes a means of exploring feelings of unworth and how they can lead to bad decisions if left unchallenged. However, the book’s personal anecdotes only go so far, and questions remain about what such transformation might look like in other people’s lives. A Beginner’s Guide sets up introductory ideas about belief, the nature of human understanding, the Bible, and spirituality to form a basis for further exploration and study. More could be said about the various topics it presents; the book explicitly encourages such reflection. Each chapter includes both a summation of its key ideas and some suggestions for further consideration. Still, the end result feels familiar. Infographics help clarify the method. One illustrates the “growth of destructive belief in emotional power and dominance” as a cloud that begins with a tiny, dragon-shaped destructive belief. The shape changes over time to fill the cloud, indicating that small things grow to become encompassing, and that early problems can exert influence beyond their original sizes. Writing is uncluttered and breezy, free from jargon and needless complications. The effect is conversational, with the narrator addressing the audience frequently as “you.” The tone is appropriate for an introductory text. 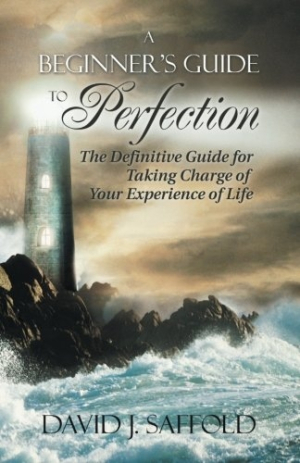 A Beginner’s Guide to Perfection mixes basic psychology with New Age awareness to offer a model for achieving spiritual wholeness, though it does not range far beyond personal experiences to do so.